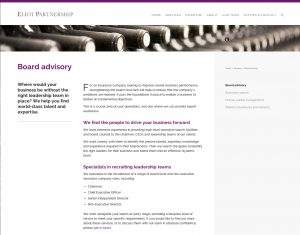 The Eliot Partnership is the global insurance industry’s leading executive search firm. The London-based firm provides a full range of recruitment services for the insurance sector – helping its clients find, attract, reward and retain the most talented individuals in the industry. When it came time to launch a new website, the company asked me to help write, edit and refine the wording. The site is a crucial element in the firm’s branding and marketing strategy, and it was essential that the copy reflect the company’s exceptionally high standards of knowledge, expertise and professionalism. All the information needed to complete the site had been compiled in a single word document. The text had been written by a wide variety of people, in different styles and with different approaches. Some of it was notes, clearly written in a hurry. It needed structuring, rewriting, polishing, and in places fleshing out so that it flowed, read well and communicated effectively. The text needed a highly professional tone of voice because of the target audience – senior people in the global financial industry. The copy also needed to address the concerns of a wide range of audiences – including recruitment professionals and managers in client companies around the world and, of course, the individuals who would be recruited into senior positions with those clients. The design of the website was already at an advanced stage, and almost ready to go live. This meant all the copy elements need to fit and match, to be written to the right length and with pull-out text and headlines in the right places, fulfilling the right functions. As an example, the home page design called for minimal copy – simply four short statements to express the company’s identity, its services, and why it is the best choice in its field. This meant adapting the ‘about’ section to do much of the heavy-lifting that on another site might be performed by the home page. Working to a very tight deadline, I completed the rewrite and edit required within a matter of days. 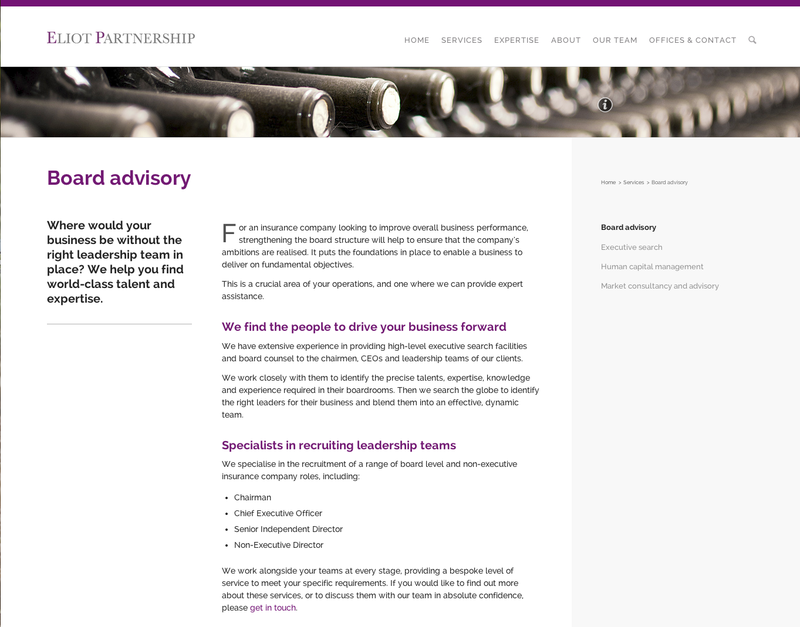 The website was able to go live on time, with text that reflected the high professional standards which are a cornerstone of the Eliot Partnership’s brand and philosophy.